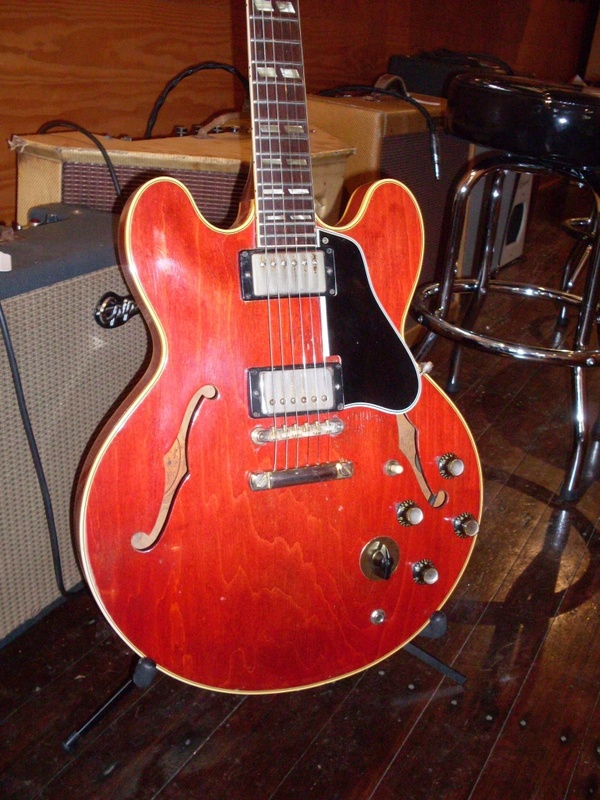 Fastest selling 345 on the planet is a “first rack” ’59 ES-345. These don’t last a week when I get them. Sometimes not even an hour. I received an email from a reader who likened the buying and selling of vintage guitars-specifically my guitars-to day trading. He mentioned that they seem to sell very quickly on a “last in-first out” basis. That can be true but to liken the guitar business to day trading is a little off the mark, I think. From a business perspective, you can look at guitar buying and selling from a few diverging viewpoints. If you’re a player and you want a tool for your playing, you will likely be less concerned about whether you get your money out of the guitar many years down the road. Your emphasis is on playability and tone-not investment potential, although they aren’t mutually exclusive. That’s why “player grade” guitars are such a large part of the guitar business. Unfortunately, player grade has often come to mean beat up and modified (regardless of how it plays) as opposed to a great playing, great sounding guitar that isn’t collector clean or 100% original. I, unfortunately, don’t control the vast nomenclature of the guitar universe. If I did, the term “sustains for days” would not exist. Frequently, a “player grade” guitar will sell very quickly as it affords a newcomer to vintage or someone who just doesn’t have the resources for a “collector grade” guitar access to these great old instruments. 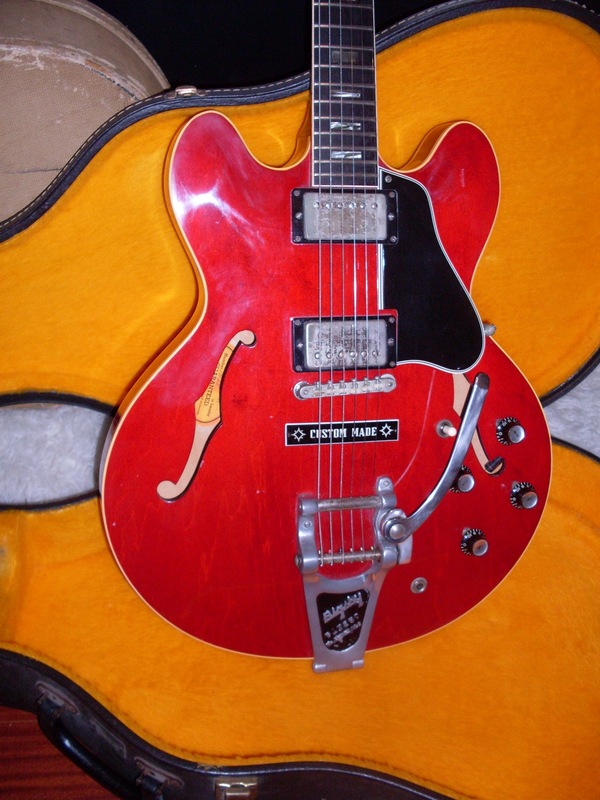 It is not unusual for a 60’s ES model to sell for a figure that approaches the reissue Gibsons. Granted, you won’t see dot necks in that neighborhood but I’ve seen plenty of Bigsby 345’s – even some from 64 or earlier-that will cost you about what you’ll pay for a new high end 335. You can argue which one is better among yourselves. I like some of the new ones but it isn’t my field of expertise nor is it my market. Player grade guitars aren’t particularly good investments from a growth standpoint but they are very liquid. I can sell a player grade 64 much faster than I can sell a near mint dot neck. Bigger market by a mile and less hassle too. The cleaner and more original a guitar is, the more scrutiny it requires to make a sale and to make the buyer happy. That’s fine but it will slow down the process. So, what made my reader make the day trader comment? I think it is due to the fact that some guitars show up on my site and are gone in a day or less. There are two very good reasons for that. One is that I keep a list of buyers who are looking for a specific year and model. They are notified-usually even before I have the guitar in hand-that the guitar they seek is coming in. Usually, those buyers see the photos and description at the same time as everyone else-when I post the guitar for sale. That’s just fairness. Often, the guitar is gone in five minutes and it looks a lot like day trading. I never, ever engage clients in a bidding war. If I list a guitar at $15000 and someone makes me an offer of $14000 and I accept it, the deal is done. If buyer number two the offers $16000, it’s too late. If buyer number one commits and then can’t pay, that’s another story. One note-most guitars show up first on Gbase and occasionally on Twitter if I remember to post them. If there is a particular year you are after, let me know and I’ll try to remember to give you a heads up when it is on my radar. I do occasionally have a guitar that is sold before I even get it in my hands. But then I post it as a hold or sold right away. That probably looks a lot like day trading. There are also guitars that I buy specifically for a particular buyer . Those never make the listings. The biggest, fastest seller of all-a red 64 “player grade”. These are often gone before I get them. This one might be a little above a player grade but you get the idea. Just another early 60’s 345? Not quite. This one has something special going on. Almost all 1958-1964 ES-335/345/355’s sound good. Great even. Those that fall a little short can usually be tweaked and be made to fall within a fairly narrow range and that range is really good to really great. The ones that fall short are almost always the ones that have neck, nut, saddle or fret issues. Sometimes that can be fixed, sometimes not. I get asked frequently about the best sounding ones I’ve had and after more than 500 ES’s made between 58 and early 65, I have a few favorites. Up until today, they were all PAF guitars. The top five were (until now) a 59 335, a 58 335, a 62 (dot) 335, a 59 345 and a 59 355 mono. Now, keep in mind that there were dozens more that were extraordinary instruments and of that 500 or so I’ve had, there were maybe 10 true dogs-all with neck problems. And also keep in mind that tone is very subjective stuff and just ‘cuz I think a guitar sounds extraordinary doesn’t mean you will. I play some blues, 60’s rock and tons of Beatles tunes. I play a lot on the neck pickup, emulating as best I can, Mr. Clapton. When I play on the bridge I want Mike Bloomfield for blues and George Harrison in the “Hey Bulldog”, Taxman” and “Paperback Writer” vein. So, you know what I like. So, where’s this magic I’ve teased you with? Well, it’s a beat up 1963 ES-345 with a heavily worn fretboard, passable fret job, new nut, changed tuners and tailpiece and early patent number pickups. This guitar that doesn’t fit the mold at all. To keep the commerciality out of it, this guitar is already on hold but I spent most of today playing it. I literally could not put it down. I sold this guitar in 2012 and was very impressed with it then but it sold so quickly, I didn’t get much of a chance to play it. What is it about this guitar that makes it so special? I honestly can’t tell you. It’s got it’s original stereo Varitone circuit. It has early patent number pickups in the 7.7-7.9K range, a neck that starts fairly thin but gets quite large by the 12th fret. It is a stop tail and has always been one. The tuners are modern Gibson Klusons although it had Grovers at some point. The bridge is the original ABR-1 with milled nylon saddles. So, what the heck is it about this guitar that makes it sing like a violin? It is among the best 345’s I’ve played. The bridge pickup is good but not quite great. But the neck pickup on this guitar rivals any 335 from any year. If there has ever been a guitar that, for me, at least, puts the “tone sucker” Varitone theory to bed, it’s this guitar. It may even be the later Varitone which actually is a tone sucker. I haven’t looked. So, what’s my theory? I think one of the factors is a properly cut and installed nut. The original nuts on Gibson from the era are almost always too tight (which is why everybody changed out the tuners in the 60’s). In many cases, when you bend the strings, the nut pinches and they go sharp. And you thought it was the tuners slipping but they can’t slip sharp. Obviously, there is a wonderful randomly great pickup in the neck. I really should take it out and install it in another guitar just to see if the magic is in there. But it could be the wood. It’s a relatively light 345 considering all that electrical stuff in there, weighing in at 8 lbs 5 ounces. The stereo VT circuit is almost 12 ounces heavier than a 335 harness. It’s also kind of a mess-heavily checked and worn-it’s been played long and hard. The red has faded to a brownish tone and it certainly isn’t a pretty thing. But holy crap…shut your eyes and play if you don’t want to look at it. I’d love to be able to quantify what it is that makes this one so special But tone is a combination of a lot of factors(including the player and the amp). It’s clear that some changes just don’t matter with regard to tone. Tuners don’t seem to matter. Re-frets done right don’t matter and can even improve tone. Nylon saddles, if they’re the milled ones and cut properly don’t matter (compared to metal) but properly notched saddles are a huge factor for sustain which affects tone. I’d like to say a stereo Varitone circuit doesn’t matter but I’ll just stir up a storm. I’ll just say it doesn’t matter in this guitar. And one more thing-I’m playing it in stereo using a stereo Y cable. And, where you set your pickup height does matter. Many ES’s have a sweet spot and it’s a trial and error thing. The height of the stop makes a small difference but more in playability than tone. So, without doing a lot of part swapping and experimentation, I’m not going to know all the answers but that’s OK. I’m happy to just call it magic. Strange and wonderful magic. 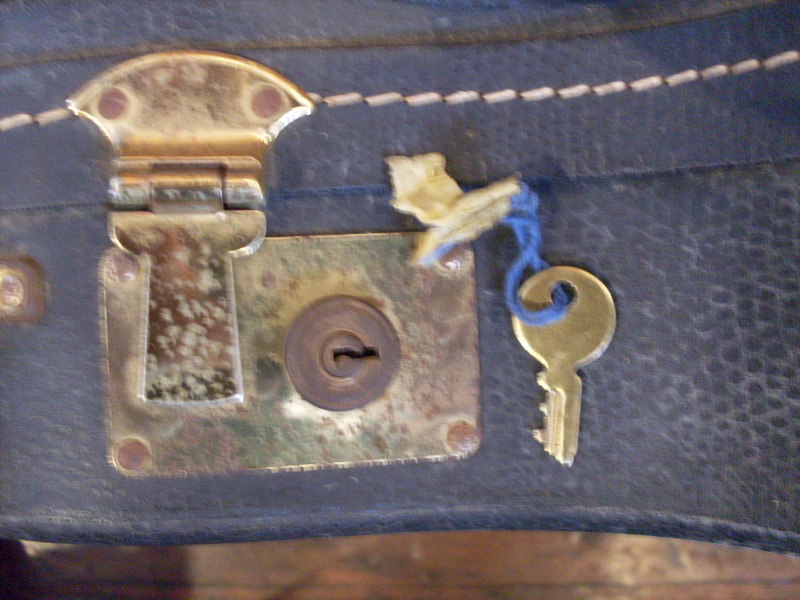 Got a Lifton or a Gibson badged case with a lock that looks like this? The right key says 6K11 or H345. Note that the lock even says 6K11 on it. So much for security. I’ve written about case keys before but I’ve had some reader questions lately and I’ve got a bit more information than I had back when I first wrote about case keys. First off, let me point out that locking your guitar into its case and thinking it’s more secure that way is kind of dumb. If I’m playing a gig in some dive bar and someone in the bar is bent on stealing my guitar, they will not be deterred. You will never hear this statement: “Oh, crap. I was going to steal this guitar but the case is locked so even if I do, I won’t be able to open it.” You all know it takes about ten seconds to break the lock off a guitar case. 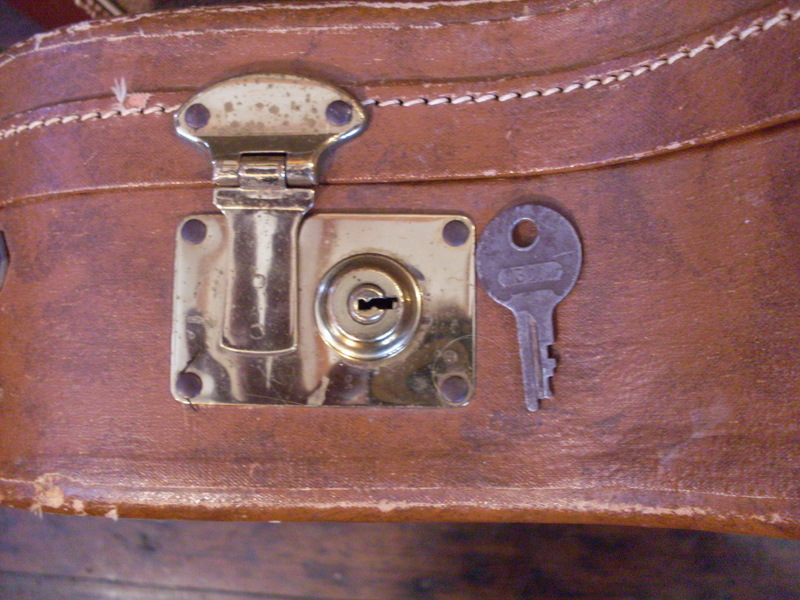 I think the only function of a working lock on a vintage case is to keep your kids from messing with your prized instrument while you’re at work or out shoveling the driveway. Your kids are probably going to figure out where you keep the key anyway. As collectors, having the original key in its little manila envelope is a nice thing, along with the little screwdriver and the other nice case candy items that came with the guitar when it was new in 1958. At least 90% of the original keys are long gone by the time these guitars get to me. Probably closer to 95%. But the good news is that all the locks from a given case maker are opened by the same key. Gibson badged cases and Lifton cases have the same lock and the same key will open them I have brown cases from 58-61 and black cases from 61-68 and all can be opened by an Excelsior key numbered either H345 or 6K11. They appear to be identical. They are pretty easy to find and will usually cost you around $15 or so. That key will open most 335/345/355 cases but not all of them. Cases for 335’s were made by Stone during the 50’s and early 60’s and Ess and Ess in the mid 60’s and later. The Excelsior keys that fit the Gibson and Lifton cases don’t fit these. Stone cases were widely used in the 50’s and a lot of 58, 59 and 60 335’s have them. They are a really good case but, unlike the Gibson and Lifton, they have one spring type latch for the locking piece and usually the springs get broken. The latches usually still work and the key, if you can find one will still work. The key for some Stone cases will also be an Excelsior (which means “ever upward” in Latin in case you care-and it’s the state motto of New York). The key for the Stone case will have the number 301 on it but it is for the type of latch pictured. 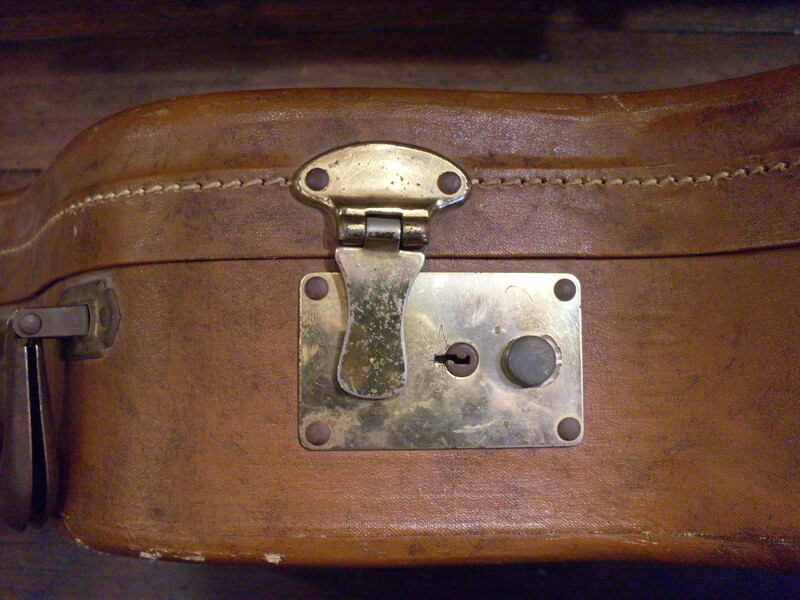 There are also brown Stone cases with a different spring latch. I don’t know what key opens these. By the early 60’s Stone Case Co. (of Brooklyn) was either gone or Gibson stopped using their product. If your case is black, it isn’t a Stone. If it doesn’t have a Gibson badge on the outside or a Lifton badge on the inside, it’s most likely an Ess & Ess (also of Brooklyn). These usually have a label inside up by the headstock (but not always) and they also. like a Stone, have a spring type latch for the lock. The key that I have that works on an Ess & Ess has no writing of any kind and it looks like a generic luggage key. Good luck. After 1969, the cases changed but some of the same keys still work. I have a black with purple interior 70’s case made by Lifton that uses the same H345 or 6K11 key. I have a grey Epiphone case from the early 60’s that uses it as well. 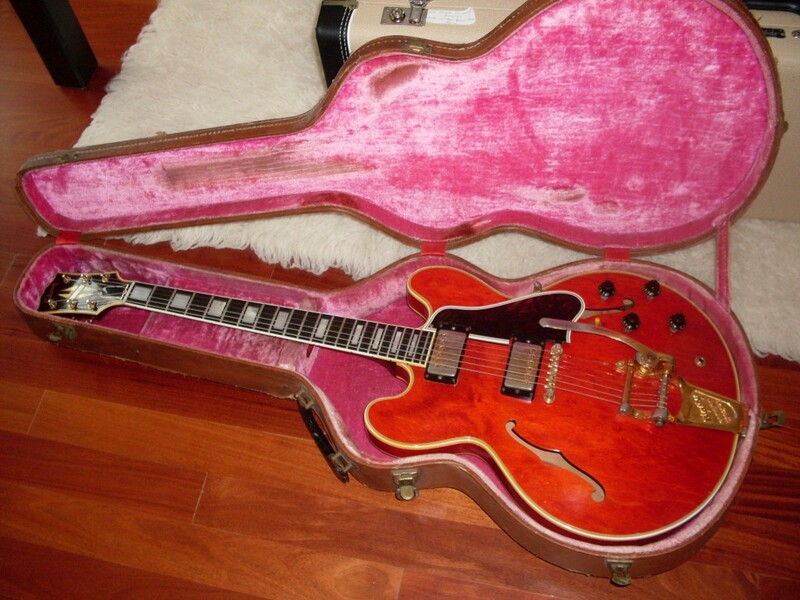 Finally, I have seen 335’s from the 60’s in Victoria cases but I don’t believe that Gibson ever supplied them. They were used extensively by Fender for the Coronado series and they will fit a 335 pretty well. I have no idea what key they used, however. If I find out, I’ll revise this post. 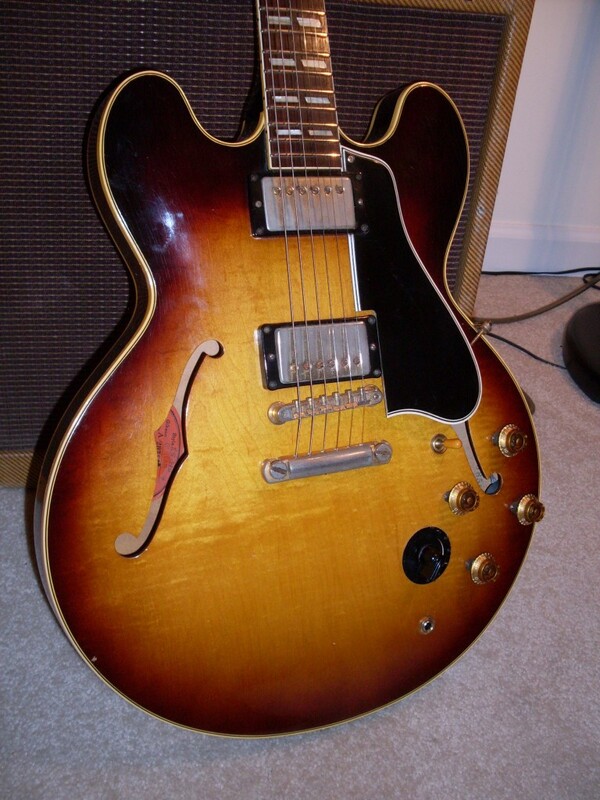 Any early 335 may have a case made by Stone. They have a spring latch-usually broken-with a key that is numbered 301. 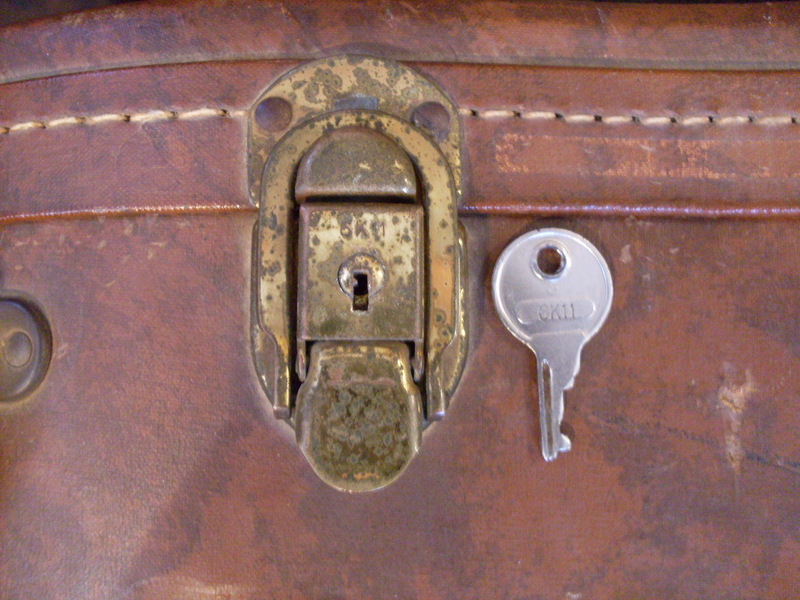 Not all Stone cases used the same lock, however. See the next photo.